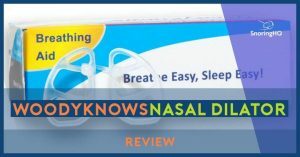 My BreatheRight Nasal Strips as a snoring aid review. What are Breathe Right nasal strips? 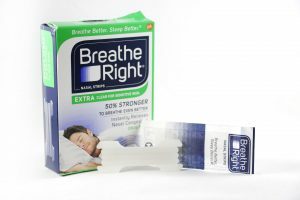 Breathe Right nasal strips are a drug-free, non-prescription snoring aids that work to mechanically open nasal passages and reduce resistance to air flowing through the nose, making breathing easier. They are flexible adhesive bands that are placed on the outside of the bridge of the nose. These are effective for users who are suffering from nasal congestion due to cold or allergies. While not primarily considered a stop snoring aid, one of the benefits of this product is that it can alleviate or eliminate snoring. In 1991, Bruce Johnson had trouble breathing through his nose at night, he wondered “why not try opening the nasal passages mechanically from the outside of the nose?” After three years of development, he had created the Breathe Right nasal strip. The device was patented and brought to market in 1992. In the UK, nasal strips became popular as a performance-enhancing aid (because they promote better sleep) when they were used and endorsed by Robbie Fowler, the Liverpool football striker. Breathe Right was originally marketed and sold by CNS. Founded in 1982 to develop equipment for brain wave analysis, CNS raised $3.2 million from its 1987 initial public offering. In 1985, the company was developing products for use in sleep disorder clinics. In 1991, Bruce Johnson was looking for clinical proof of the effectiveness of Breathe Right strips, and a relationship with CNS was forged. In 2006, GlaxoSmithKline (GSK), the British pharmaceuticals behemoth acquired CNS for $566 million. GSK, known for its pharmaceuticals, made the acquisition to boost its consumer healthcare division. Governments in countries with nationalized healthcare are always looking for ways to reduce healthcare costs, and safe over-the-counter products are an effective way of doing so. 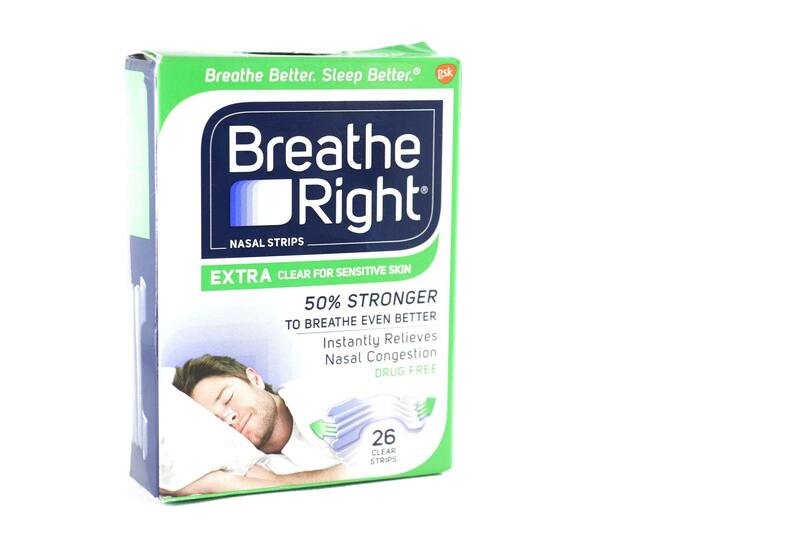 With the CNS acquisition, GSK acquired Breathe Right strips as well as the Fiber Choice brand. The snoring aids market has many different sub-categories. There are two types of nasal dilators. The first of which are products designed to fit inside the nasal passages, such as Nozovent and WoodyKnows. The second category is nasal strips that adhere to the outside of the nose and includes Breathe Right strips. Direct competitors to Breathe Right strips include Snoreeze, MQ Better Breath, Sequoia Breathe-ability, Premier Value nasal strips, and many stores (including Walmart) carry private label versions of these products. How do Breathe Right nasal strips work? Breathe Right strips are single-use flexible, “spring-like” bands. The underside of each band is an adhesive layer that sticks to the skin on the outside of the nose right above the flare of each nostril. As the bands attempt to straighten out, they lift the sides of the nose and open the nasal passages. The human nose is divided into two nostrils. At the back of each nostril is the nasal valve which is a tiny opening that measures about 1/10” wide. All the air that you breathe through your nose must pass through these two tiny openings. The nasal valves are easily blocked, most often from nasal congestion due to cold or allergies. The Breathe Right strip widens the space by pulling open the cartilage walls of the nasal valves, making it easier to breathe. The strips can be a bit tricky to remove. The adhesive must be strong enough to stay in place for 8 hours. If not removed carefully, the adhesive can leave blemishes on the user’s skin. There is an option for sensitive skin which is easier to remove. While the company claims Breathe Right strips offer immediate relief, some users report that it took up to 30 minutes for them to feel the effects. What are the options for Breathe Right nasal strips? All the Breathe Right products are approved for use by people 5 years and older. GSK claims all the products open the nasal passages up to 38% more than with nasal decongestant sprays alone. 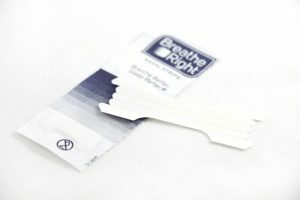 Breathe Right Original nasal strips come in two sizes, small/medium and large. Breathe Right Extra is 50% stronger than the original. Breathe Right Clear is recommended for people with dry or sensitive skin. It provides the same benefits as Breathe Right Original, and is available in two sizes, small/medium and large. Breathe Right Extra Clear provides the same benefits as Breathe Right Clear and is 50% stronger. Breathe Right Lavender offers the same benefits as Breathe Right Original and is impregnated with the calming scent of lavender. Single-use Breathe Right strips cost about $.30 per night. Although a clear material was chosen for the sensitive skin option, they are not invisible and are noticeable on daytime wearers. My first night, I applied a Breathe Right strip to see how it felt and if it was comfortable enough to sleep with. I’m not sure if I applied it properly, as I could not get the edges to stick. I decided not to use the snoring app for the first night. I slept well and woke up early the next morning. The strip stayed attached all night, which surprised me. When I woke up, I was aware that the strip felt annoying. It was not painful, but I was aware that it was there and wanted to take it off. Which was like ripping off a band-aid. Removal was painful. On the second day, I tried using a Breathe Right strip for a 30-minute nap. I recorded my breathing during the nap. Heavy breathing but no snoring, which I took to be a good sign. During ensuing nights, I used my snoring app and did not see any improvement in my snoring or breathing. When I use a nasal dilator (one of the products that fits inside the nostrils), I immediately notice an improvement in my breathing. Does Breathe Right work for snoring? Another nasal snoring solution I’ve reviewed is Woody Knows. Does Theravent Work to Prevent Snoring?